One of the finest octagonal houses in Ontario, this impressive building was erected in 1882 by Henry James Bird, a prosperous local woollen manufacturer. In its unusual design it illustrates the architectural theories of Orson Squire Fowler, an American author and lecturer who claimed that many-sided structures provided healthier, more efficient environments for their inhabitants than rectangular buildings. In keeping with Fowler's views, the house was solidly constructed of fieldstone and poured concrete and contained such innovative features as ventilation shafts and a dumb-waiter. 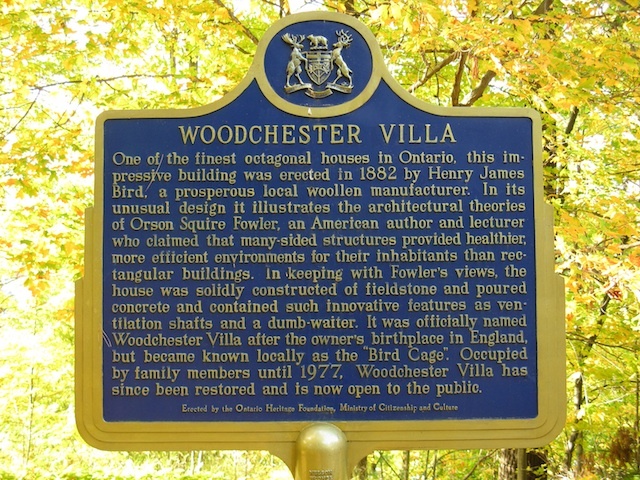 It was officially named Woodchester Villa after the owner's birthplace in England, but became known locally as the "Bird Cage". Occupied by family members until 1977, Woodchester Villa has since been restored and is now open to the public.